You've found the “U.S. Racka Sheep Breeders” page here at Hobby Farm Wisdom! If this is the first time you have visited our site: Welcome! 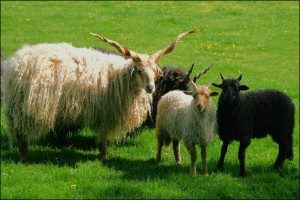 Racka (Hungarian Screw Horn) sheep are a unique breed of domestic sheep from Hungary that have both rams and ewes with long, spiraled horns that grow almost straight up from the head. Mature rams can have horns as long as two feet. Most commonly, this breed is seen with brown hair on their head and legs and fleece that varies between light to dark brown and white. Rarely, Racka sheep are seen entirely black. The fleece has a softness and crimp that makes it desirable for hand spinners. Racka sheep have a reputation for having a quiet temperament and being an exceptionally hardy breed. It is often used in crossbreeding since this trait passes to its offspring.